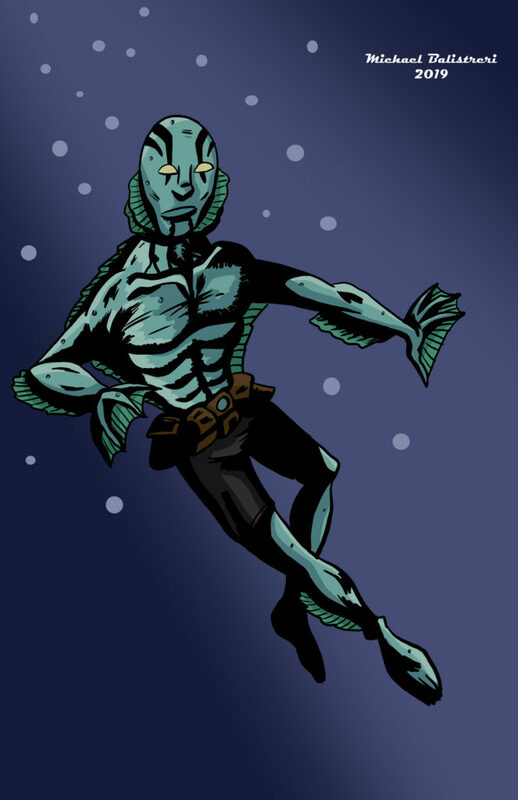 Day 103 of the #365drawingchallenge winds down Hellboy Week with the aquatic BPRD member Abe Sapien. This is an awesome character who almost ranks up as high in popularity as Hellboy himself. His portrayal in the original Hellboy movies helps, although there are a few pretty specific differences between that film version and the comic version. Chief among them the psychic powers. He has a cool backstory where he was seen more as a creature to be tested until Hellboy put a stop to it and started treating him like a person, so they have a pretty strong bond. Of course the design is very reminiscent of the Creature from the Black Lagoon, which is another awesome character with some great movies. I was pretty surprised he was left out of the new movie (aside from a tiny cameo), but I guess it makes sense if they really wanted to try and differentiate themselves from the previous movies by focusing mostly on side characters that had not been shown on screen before. He is a very central character in the Hellboy universe, having a unique connection to Rasputin when he through the harpoon through his chest. Plus a very prominent role in the BPRD series spinoff, and his own spinoff series focused entirely on him.